Copacabana Shores, located on the central coast of NSW, features spacious, fully self-contained accommodation. We’re located just across the road from Copacabana’s gorgeous beach and a leisurely stroll to the local village where you can find inviting cafes and shops. Relax and take in the fresh sea air in our family friendly accommodation on the Central Coast. Awarded 4 ½ stars our beachfront central coast accommodation fills up quickly so make sure you book in advance. Copacabana Shores is ideally located for people wanting a quiet and relaxing holiday with access to all that Central Coast has to offer just minutes away from popular city attractions such as Avoca Beach, Terrigal and Bouddi National Park. Our most popular accommodation is our quality studio spa suites and for groups and families there is our deluxe townhouses. Our generous room sizes with fully equipped kitchens offer all the comforts of home with the stunning beach just a walk away. There is a lot to discover when you stay in our holiday accommodation. 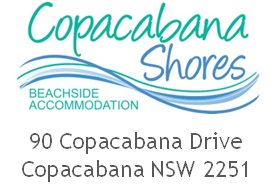 Just 90 minutes from Sydney it’s the perfect weekend escape or family holiday book online today to secure great accommodation specials from Copacabana Shores.